UPDATED: MAR 11, 2019 Õlle on selline jook, et iga uus kord kui klaasi või pudeli suule tõstad, siis leiad midagi uut, sõltuvalt tuhandest-miljonist pisiasjast, mis hetke olukorda mõjutavad. Seega piirdun iga õlle juures selle tekstiga. 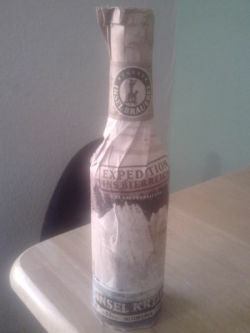 UPDATED: MAR 3, 2019 750 bottle wrapped in decorative paper label. Pours a massive foaming bubbly white and has a yellowish pale golden appearance. Slightly excessive carbonation. Aromas of grass, herbal, sweet malt. Flavours are malty, some spices and herbal notes. Has a drying mouthfeel. Pretty disappointing overall. UPDATED: MAR 3, 2019 33 cl. bottle @home, gift from my parents. Hazy light yellow with a very thin white head. Malty fruity taste. Sweet taste with a thin body. Bit boring. UPDATED: FEB 27, 2019 Aroma is light malty and banana. Hazy amber with white head. Taste is light sour, not much else. Light body, watery feel and light sour finish. UPDATED: FEB 10, 2019 Nice bottle and the bottle is in paper, perfect for me, a lot of information here. Cloudy yellow beer with heavy fine white head, but the head is short, smell is sour, like as Champagne, also herbs, taste is very fresh, light, you cannot feel the alcohol, thin texture, light citrus, fizzy carbonation, finish is dry, perfect (I have 0.33l bottle with best-before 17.01.2021) In my opinion this isn’t Witbeer, this is a Champagne Ale from beer style! UPDATED: JAN 21, 2019 Bottle from lcbo. A very authentic peasants beer, earthy and citrusy and sweet with some dryness and a bit of peppery / phenolic spice, it's all very rounded in. Apple and some lightly sour and tart pale fruit. Has a turbid look and stacks a good creamy head. A German beer drinker's Belgian Wit. UPDATED: JAN 16, 2019 Slightly cloudy golden color with white head. Aroma has floral notes, peppery yeast esters and some mineral notes like sulfur. Taste starts with a light malt and wheat sweetness, mineral yeast, light yeast spice and a very light hop bitterness on the finish. Light body with medium carbonation. Quite smooth mouthfeel with a nice yeast character. UPDATED: JAN 13, 2019 750 ml bottle from the LCBO. Pours a cloudy golden orange colour with plus-sized white head. Aroma is yeasty esters, grassy and herbal character with a little funkiness. Flavour is stewed apple, pear, herbs, grass and gentle funkiness. Fine carbonation. Nice. UPDATED: JAN 6, 2019 30/12/2016 Bottle @ Aarhus tasting, saxo’s. Aroma is light malty and banana. Hazy amber with white head. Taste is light sour, not much else. Light body, watery feel and light sour finish. UPDATED: JAN 6, 2019 Beautiful paper-wrapped 750ml bottle with an oversize bottle cap. The carbonation is very nice, Brut with tiny bubbles all-around. Big frothy white head, very long retention and some spotted lacing. Hazy bright golden colour. Yeasty witbier nose with some spicy notes, grassy hops and grape notes. Flavours are blended between the mild grape sourness, white beer yeast and some bitterness from the hops. A mix of dryness and tartiness for mouthfeel. A different take on a Witbier from the ones I am use to. If you like the grassiness in the style, this might be for you. Looks great !